The Education Secretary says she was well aware of the damage she was doing when she rolled back trans-inclusive guidelines in 2017. 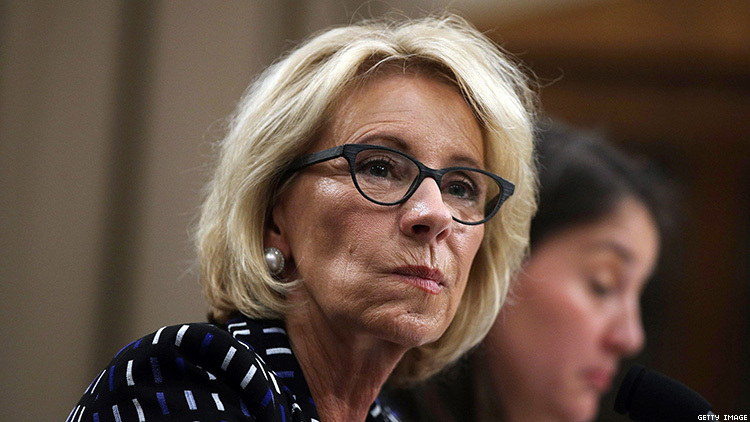 Education Secretary Betsy DeVos testified today in front of the House Education and Labor Committee, fielding questions about her controversial decisions to roll back affirmative action guidelines, as well as trans-inclusive guidelines put in place during the Obama administration. Civil Rights Subcommittee Chairwoman Suzanne Bonamici, a Democratic congresswoman from Oregon, was not about to let DeVos get off the hook for putting the lives of trans youth in danger.
.@RepBonamici to Sec. DeVos: When you rolled back guidance protecting rights of transgender students, did you know that the stress of harassment and discrimination can lead to lower attendance/grades as well as depression for transgender students?